Mac用デザインツール「Sketch」のMac App Store版のライセンス移行期限は2017年3月31日まで。 | AAPL Ch. 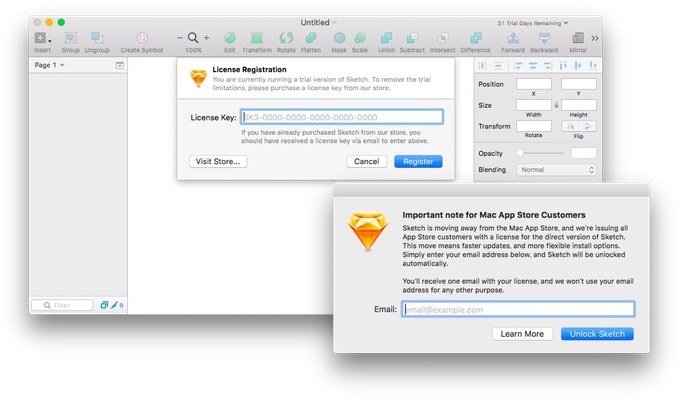 At the end of 2015, we announced an important change in how you receive updates to Sketch. After much thought, and with a heavy heart, we moved Sketch away from the Mac App Store. If you’ve not transitioned your license yet, please see “What steps do I need to take” below. The deadline is March 31st, 2017. To migrate to our own version of Sketch (which has advanced much since we left the App Store), please email us your Mac App Store receipt (as either PNG or PDF). Please email it to us using licensing@sketchapp.com. It should contain your name, email, order number and date of purchase. We will the provide you with a license key to the new version.